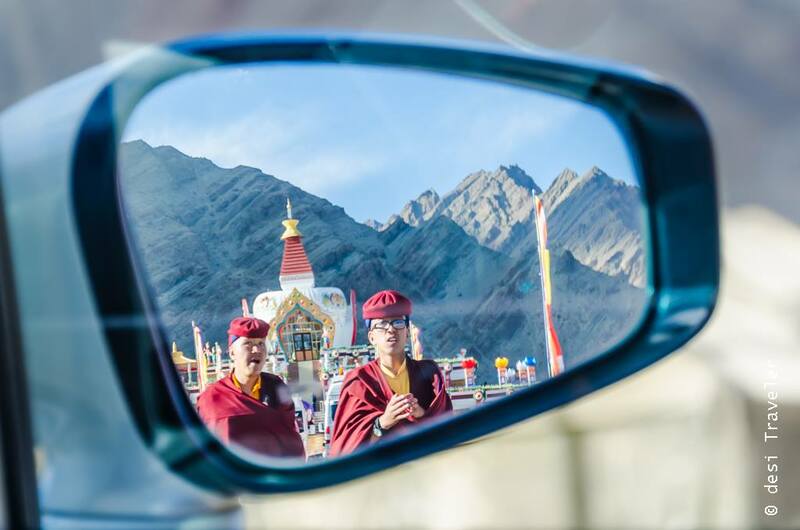 For more than 2000, years Leh was the final frontier, a few people knew it even existed, even less wanted to visit Leh. Then after the movie 3 Idiots, getting Lehed became something to be proud of. 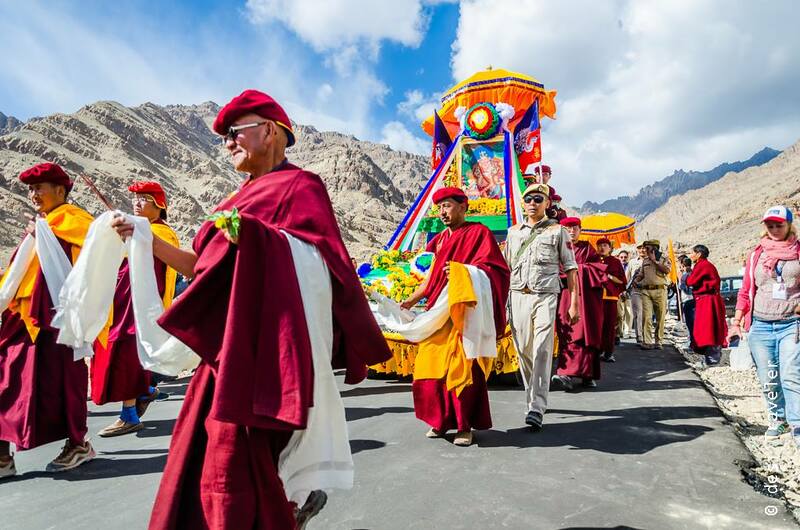 Thankfully for thousands of years, Ladakh was not on anybody’s agenda except for Buddhist monks and an odd invading army from Central Asia on his journey to more lucrative places to plunder. Isolation due to harsh terrain to travel with heavy snow in winters leading to the closure of passes every winter meant that very few people had wanted to be “ Lehed” All this led to the evolution and enrichment of a distinct Ladakhi way of life that had its strongest roots being nurtured by Drukpa Order of Tibetan Buddhism. 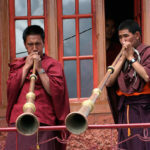 Today the Naropa Festival is known as the “ Kumbh Mela of Himalayas” and is celebrated once in every twelve years. Who was Saint Naropa you may ask ? Well, Naropa was the holy saint who spread Buddhism in Ladakh and surrounding areas and is revered as the holiest of the Lamas even today after 1000s of years. But what I was totally not ready was that originally Naropa hailed from Bengal and he travelled all the way to Tibet and learned about Buddhism. 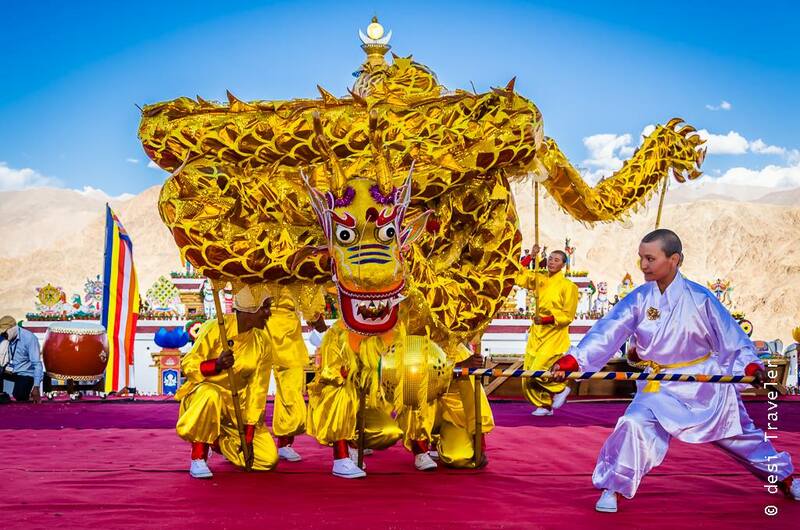 The Naropa festival is celebrated to remember and honour him and the festival is one of the most important festivals for the people of Leh and those who follow Drukpa lineage of Buddhism in Leh, Bhutan, Tibet, Nepal etc. What is The Significance of Naropa Festival & Sacred 6 Bone Ornaments of Naropa ? Then, Naropa offered Marpa the Six Bone Ornaments and prophesied that the Six Bone Ornaments would remain in the lineage that sprang from Naropa and would be used as devotional support. For close to a thousand years, the Six Bone Ornaments have been used as a relic of devotional support. 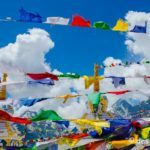 Devotees believe that worthy seekers of truth may obtain enlightenment by merely seeing it and is regarded as a living piece of Himalayan history. 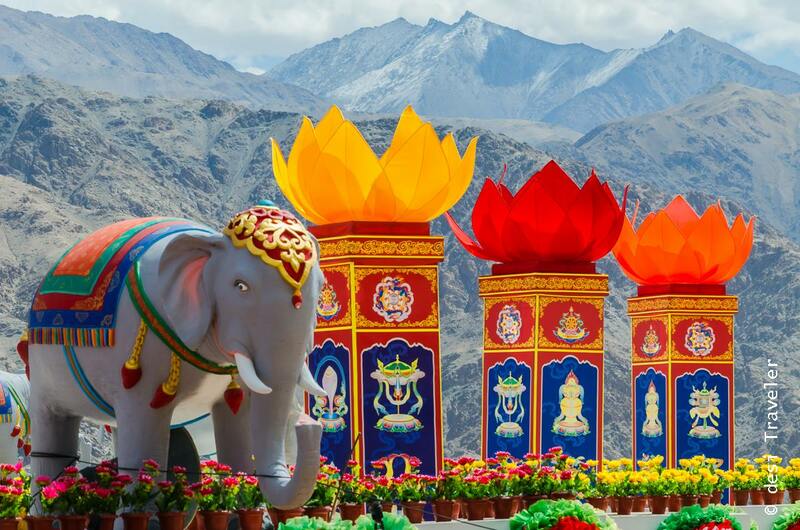 Now, every 12 years, on the rooftop of the Himalayas, the Gyalwang Drukpa dons the Six Bone Ornaments in Ladakh, India at one of the Himalayas’ biggest gatherings. 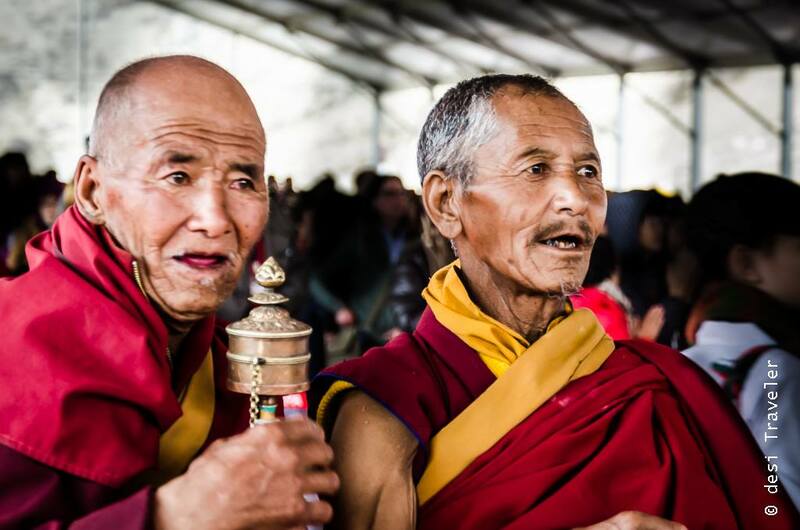 Hundreds of thousands of people around the world flock to the month-long ritual to partake in one of the oldest, most sacred ceremonies of the Himalayas. 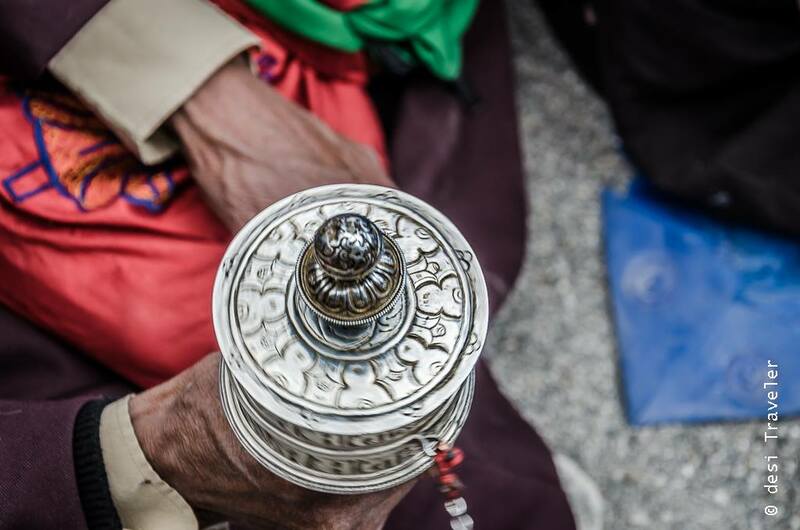 For many, they come to pay homage, others come to receive blessings, but to the people of the region, it is a symbol of devotion, compassion and a reminder a rich heritage. 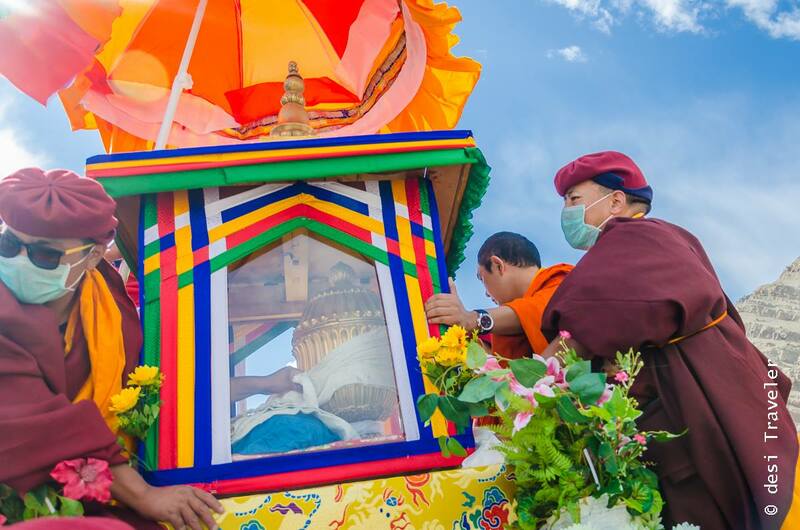 During the Naropa festival His holiness the Gyalwang Drukpa, the current reincarnation of Naropa adorns the 6 Bone Ornaments and blesses the devotees. 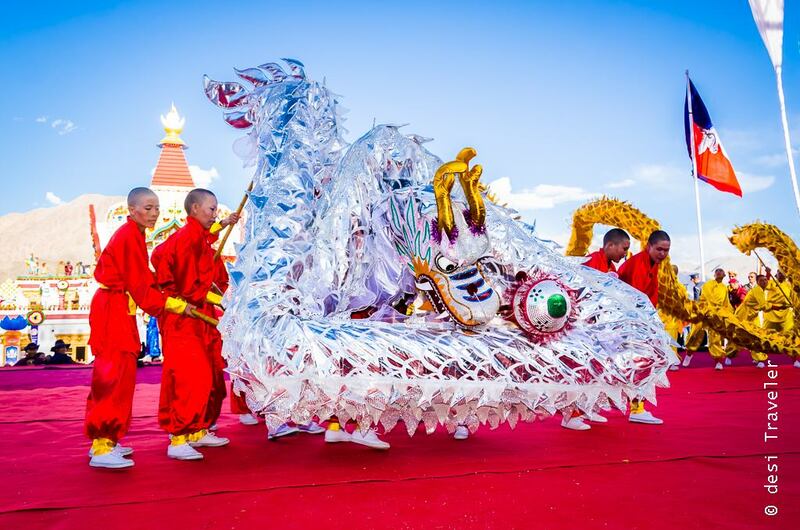 During the festival, devotees throng for the sight of them Sacred 6 Bone Ornaments of Naropa. Later in the day and throughout the festival the sacred 6 Bone Ornaments were kept in the Naropa Palace for the people to see them as it is believed that the sacred 6 Bone Ornaments of Naropa provide liberation on sight. 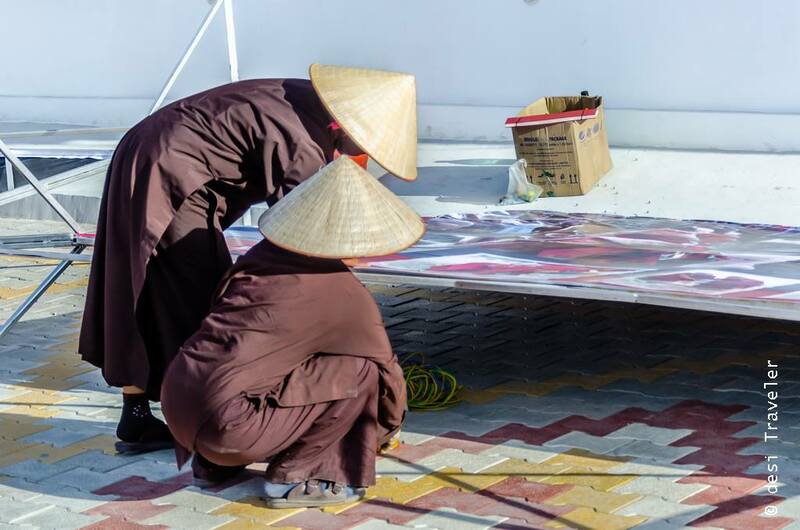 Can you guess from which country these volunteers came for Naropa Festival ? 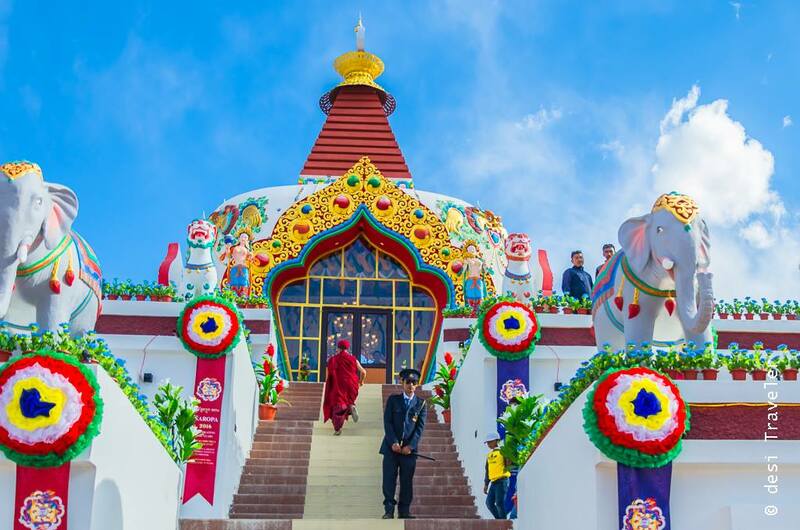 Though initially, I thought that Naropa festival is a purely religious festival but my visit on the kind invitation of His Holiness was an eye opener for me. 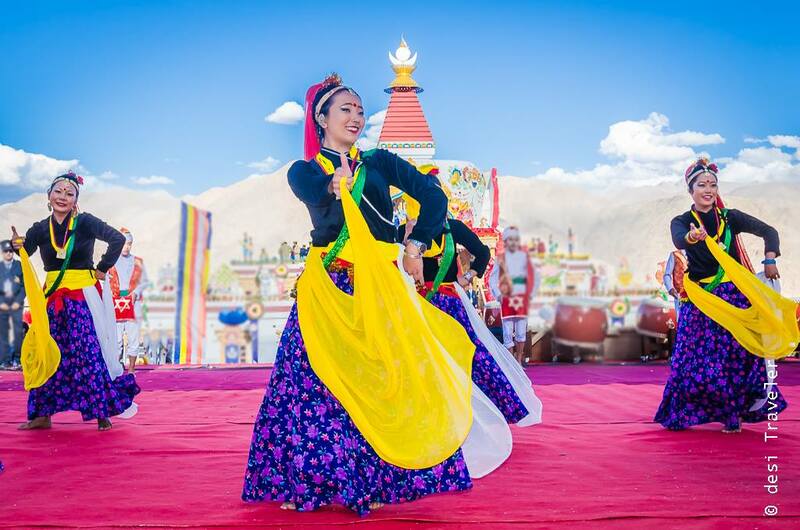 Not only the Naropa Festival has the religious significance it is also a confluence of devotees from various parts of the world who actively volunteer and participate in cultural festivities ranging from local art forms like song and dance but also martial skills like archery. 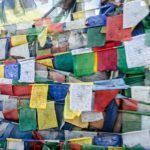 I believe this is a great way to keep the rich and unique cultural and religious heritage of Ladakh and the Drukpa Lineage that inspires countless people in Ladakh and beyond. 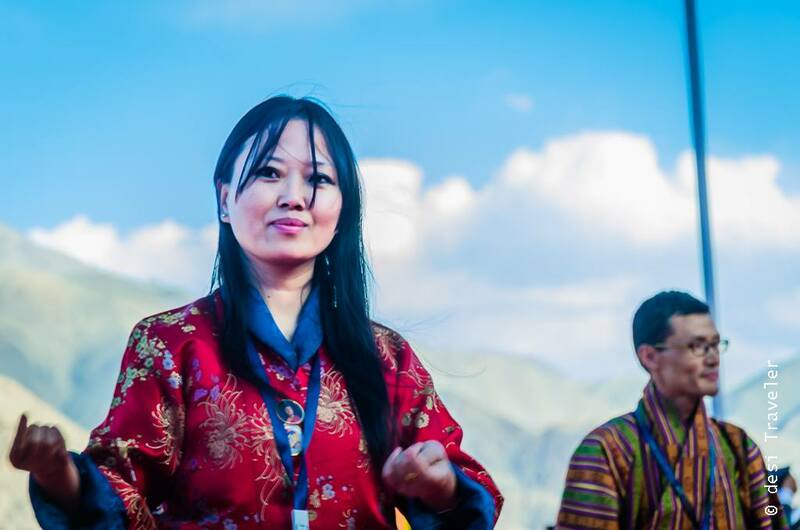 I visited the Hemis Monastery and Naropa Palace a few days before the beginning of the festival and was happy to see volunteers from Bhutan, Darjeeling, Nepal and even from Vietnam contributing to the preparation for the festival. 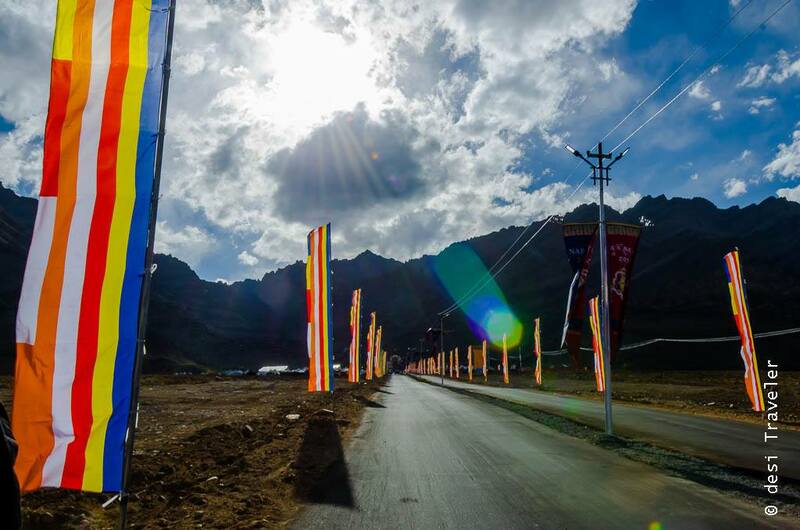 The first day of Naropa Festival 2016 the festival began with a sacred and joyous procession starting from the ancient Hemis Monastery and marching towards the newly constructed Naropa Palace. 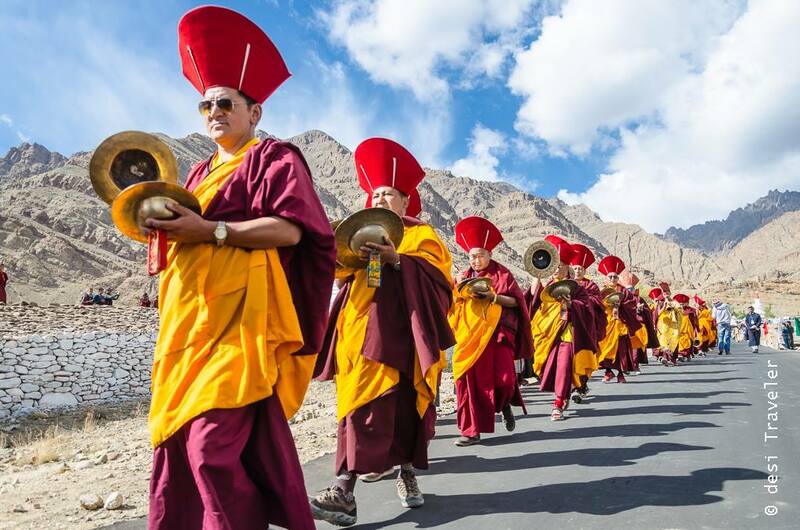 Lamas and nuns march in neat lines playing traditional Buddhist musical instruments while the 6 Bone sacred ornaments were carried in a special vehicle along with His Holiness The Gyalwang Drukpa. 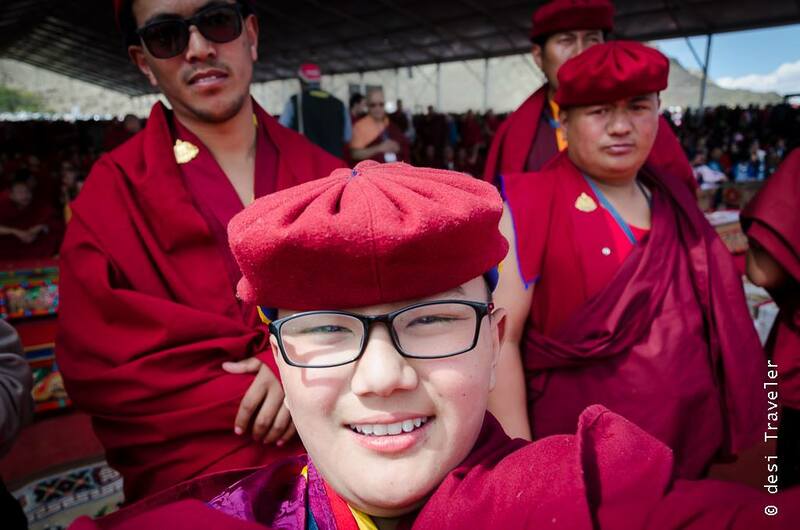 I must say that I was fortunate to click the procession and see His Holiness from a close quarter during the festival. In a sacred ceremony, his holiness unveiled and adorned the sacred 6 bone ornaments. The emotions that ran through those present were to be seen to be believed in. Not just local Ladakhi people but also foreign nationals were seen watching the processions with folded hands and offering prayers. 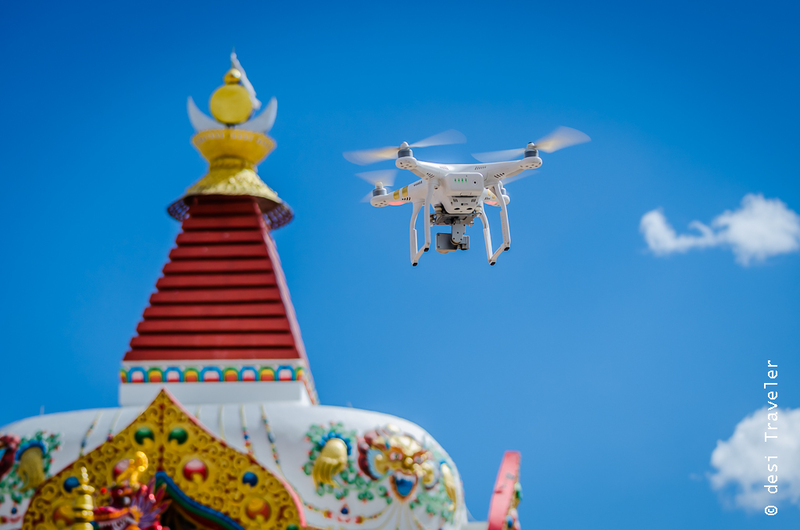 But like I said the Naropa festival surprised me in more ways than one, on one side 1000-year-old Sacred bone ornaments were on display simultaneously one of the Lama jee was capturing the proceedings in via his drone. This was the truly Incredible India moment for me thousands of year old ceremony being captured using a drone by a Lama jee. The arrangements at the festival for both the invited guests, dignitaries, media and the local pilgrims were some of the best I had seen. 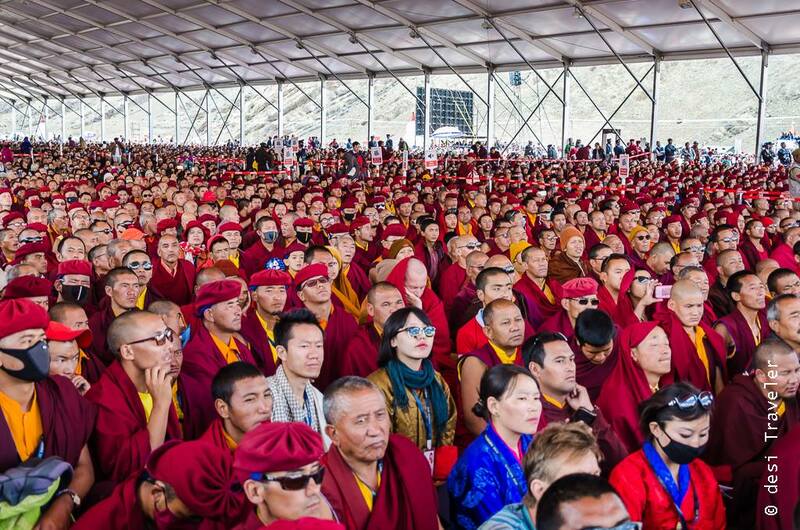 There were tents for the pilgrims as well as the lamas and invited guests and a large stage was created to host various cultural programs like ceremonial dances from various monasteries. Not just stage but also other facilities for visitors were provided during the festival on all days. There was ample arrangement for parking, drinking water and that Achilles heel of any Indian festival – the toilets. 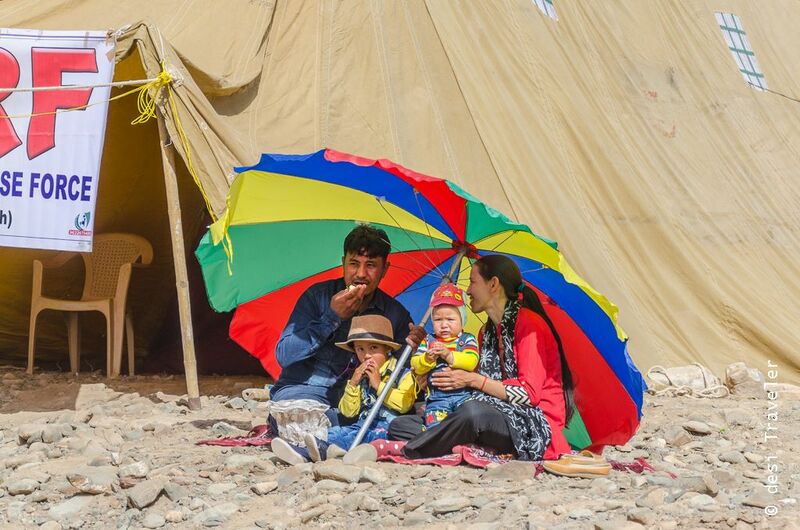 I am so happy to say that in remote Leh at the Naropa Festival the organisers have made sure that there were ample mobile toilets for visitors. The way the festival was managed can easily be a case study in organising large events footfall of lakhs of people. 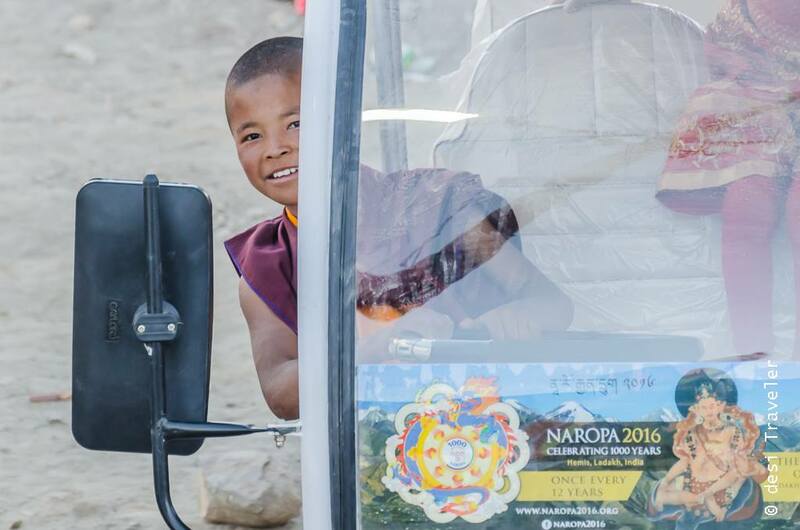 If I am allowed I must give a big round of applause to His Eminence Drukpa Thuksey Rinpoche, the head of the organising committee for Naropa Festival 2016 and his team. 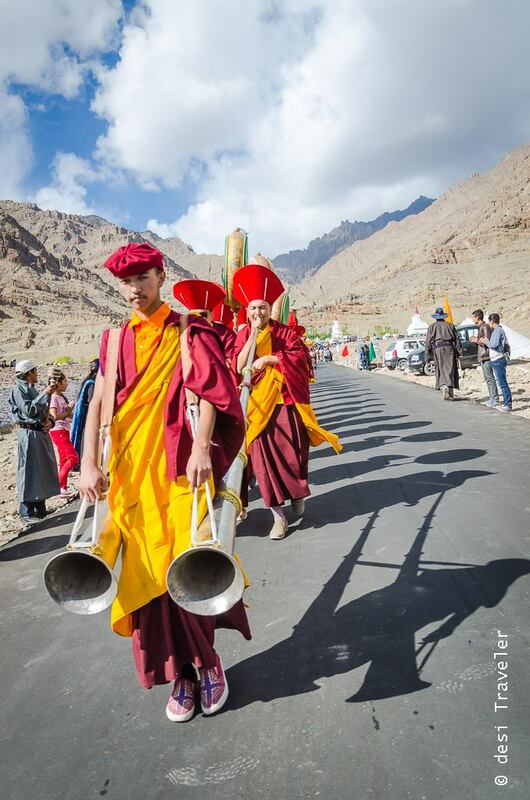 Later in the day, there were many cultural programs presented by local as well as visiting dance and song groups from various monasteries from India and abroad. 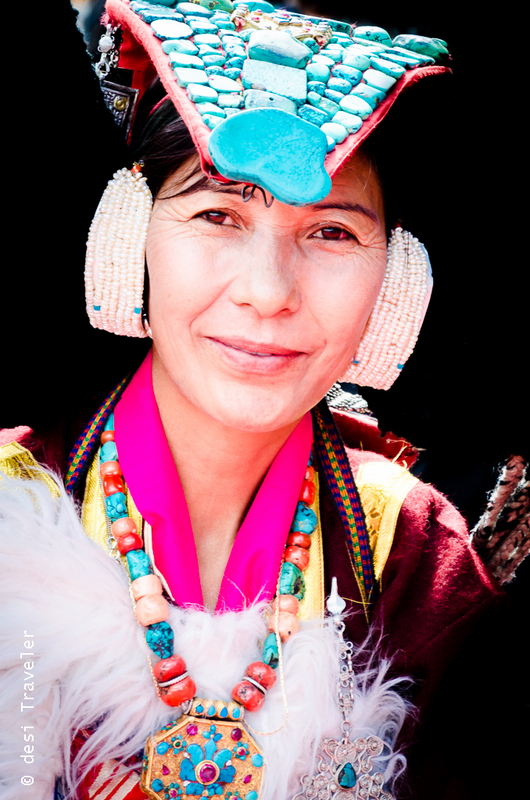 The traditional attire of Ladakhi women was quite a rage among visitors and we all just loved their colourful clothes and lovely smiles. It is only a matter of time before these colourful clothes made from local fabric take over the fashion capitals of the world. 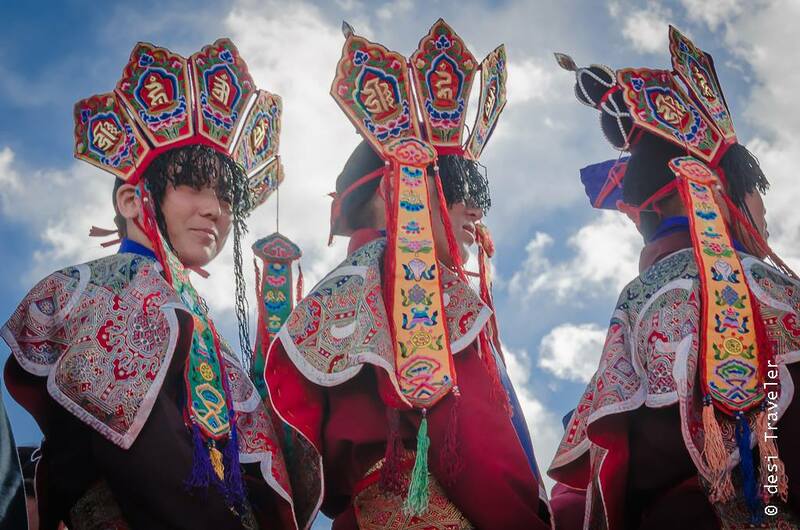 • Traditional Ladakhi folk dance by local Ladakhi village women in their colourful stone headgear, traditional ornaments and clothes. • The participants from Druk Amitabha in Nepal presented a very beautiful dance drama that reminds you of fast flowing rivers in the higher Himalayas. • Similarly, participants from Thimphu presented a very melodious song and dance that had the freshness of mountain air riding on sacred hymns. Later in the evening, there were performances by Bollywood singer KK which totally made the crowd go gaga. Some of the other Bollywood artists that performed on later days included – Vishal & Shekhar, Shankar-Ehsan-Loy. Among Hollywood stars notable among those present was Michelle Yeoh better known for her role in movies like Crouching Tiger Hidden Dragon and also appearing as Bond Girl in Tomorrow Never Dies. But she was here at the Naropa Festival as she is the global ambassador for Global Ambassador of Live to Love, a humanitarian organisation supported by His Holiness. 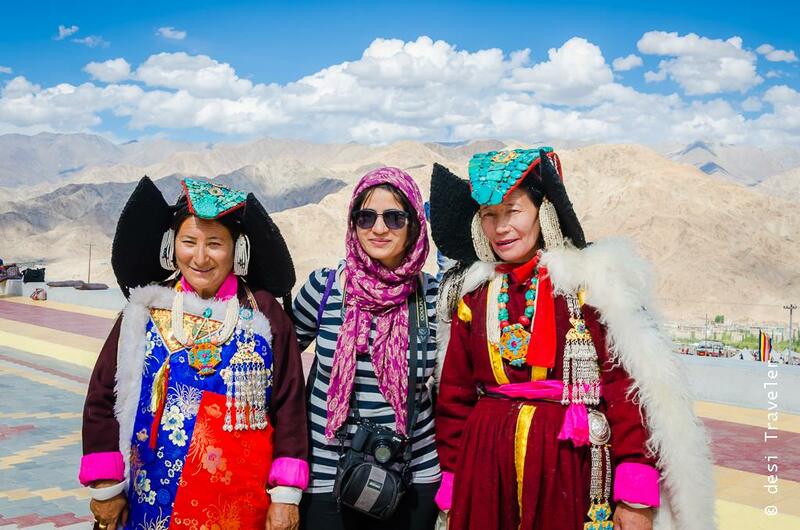 My favourite memories from the Naropa Festival 2016 are of meeting and interacting with the wonderful people of Ladakh and meeting other travel writers and bloggers from around the world. 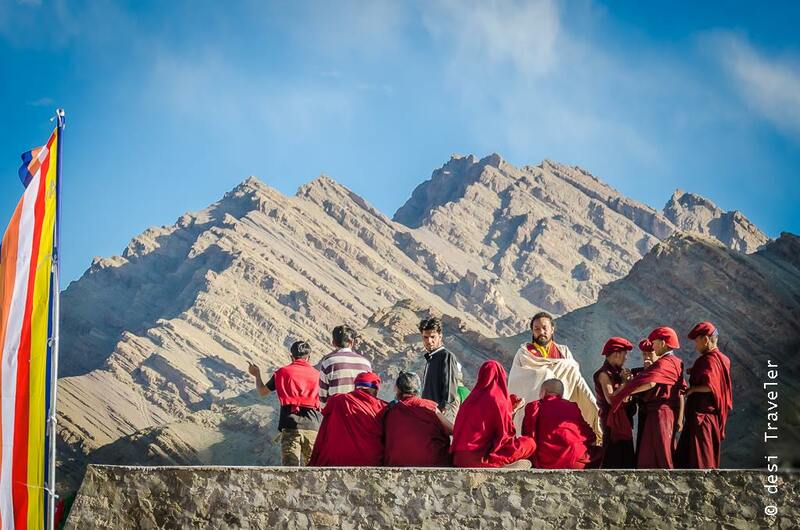 I totally loved the experience of clicking shy smiles of Ladakhi women to little monks who happily posed for pictures or observing senior monks watching the ceremonies of the festival it was an experience I will cherish for long. 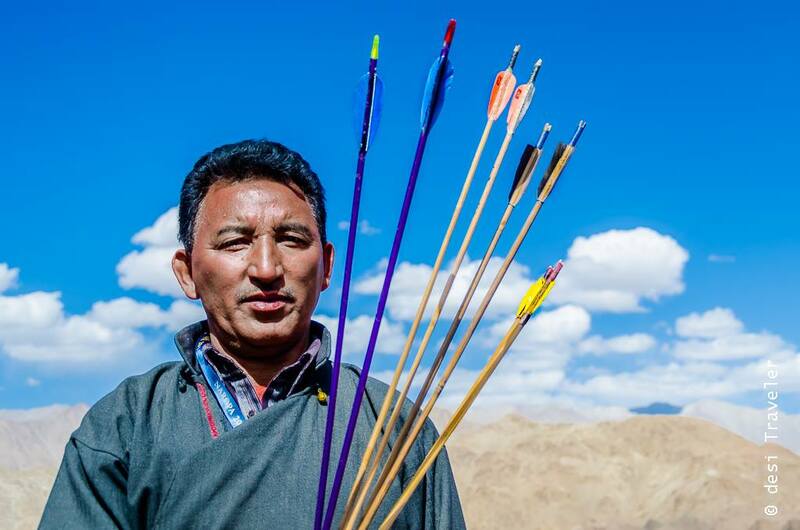 On the subsequent days every day in the morning a sacred ceremony was performed and later there were cultural functions that ranged from the play performed by local artists to archery competition in which the archers from Ladakh villages displayed their martial skills that were once essential for survival. I am sure with proper training some of these archers can sure bring home an Olympic medal or two for India as they pick up the sport at a young age and continue to practice it in local competitions. Mind you the bows and arrows the archers used in the competition at Naropa festival were not to be taken lightly, for these powerful weapons were used to kill the enemy in ancient times and also for hunting, though now they shoot arrows only for sporting glory. The earlier handmade Bows are now replaced with very precise Bows purchased from Delhi. 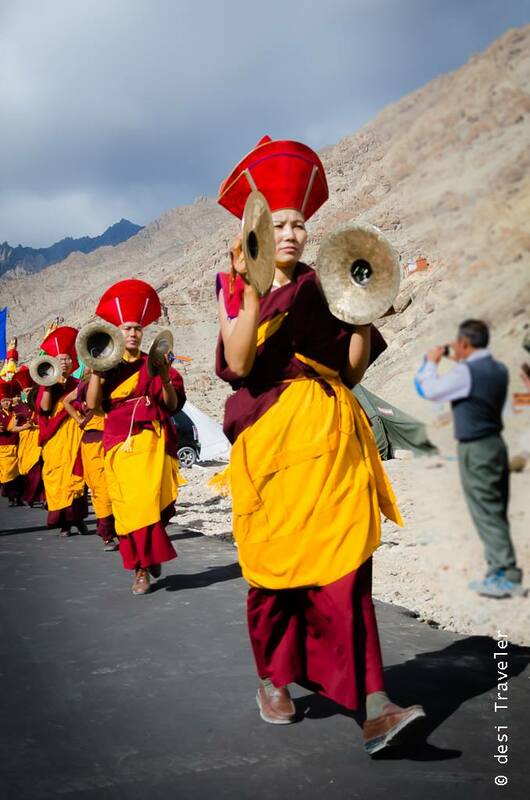 So don’t be surprised if your Ladakhi friend wants you to bring a Bow from Delhi on your next visit to Ladakh. A major highlight of the last day of the Naropa festival 2016 was the ceremonial unfurling of a giant silk tapestry of Saint Padmasambhava, the patron saint of Tibetan Buddhism. 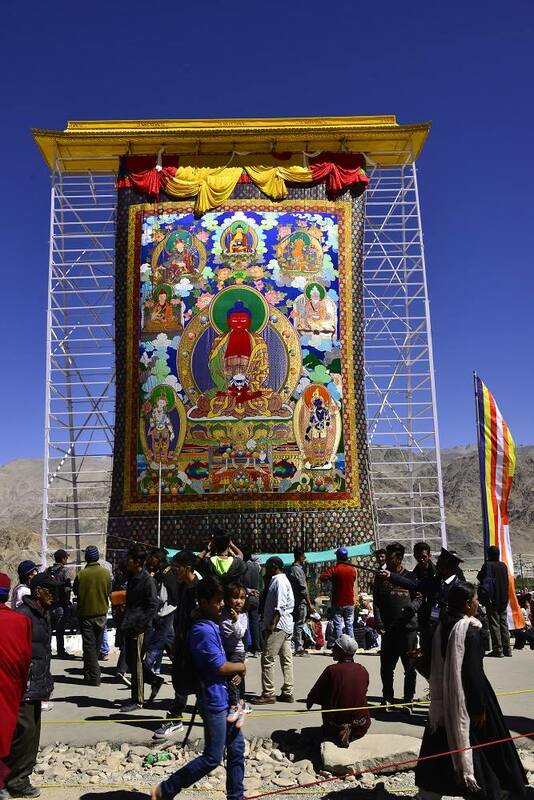 This giant brocade known as Thangka in Tibetan is more than 2 stories high and is only displayed during special occasions like Naropa Festival. 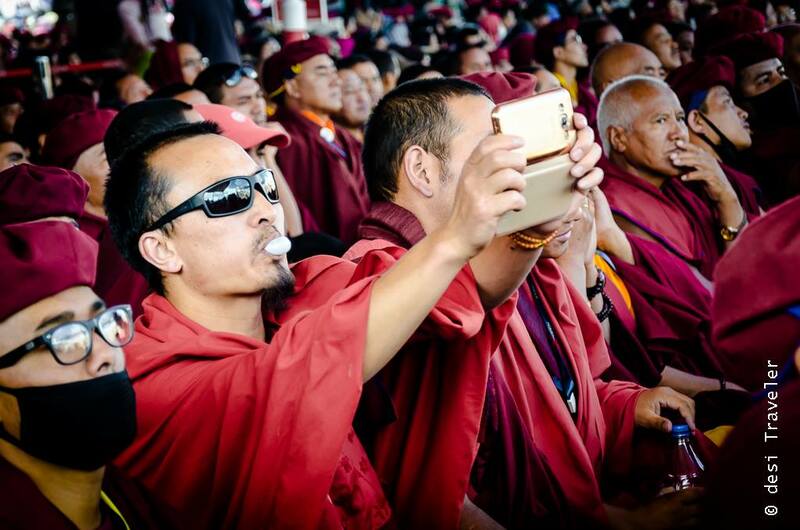 Overall I must say that I am very lucky to have attended the Naropa 2016 in Leh and I must thank His Holiness the Gyalwang Drukpa to invite me as part of a media group that had journalists, bloggers, photographers etc. from around the world. I may have come back from Naropa Festival but the memories will linger for long and I will continue to think and dream about Naropa Festival when I will reflect on one of my best trips in life so far.We have a lot to learn from the people of Ladakh as I mentioned in my earlier post about the Naropa Festival and organising a wonderful festival is only one of them. 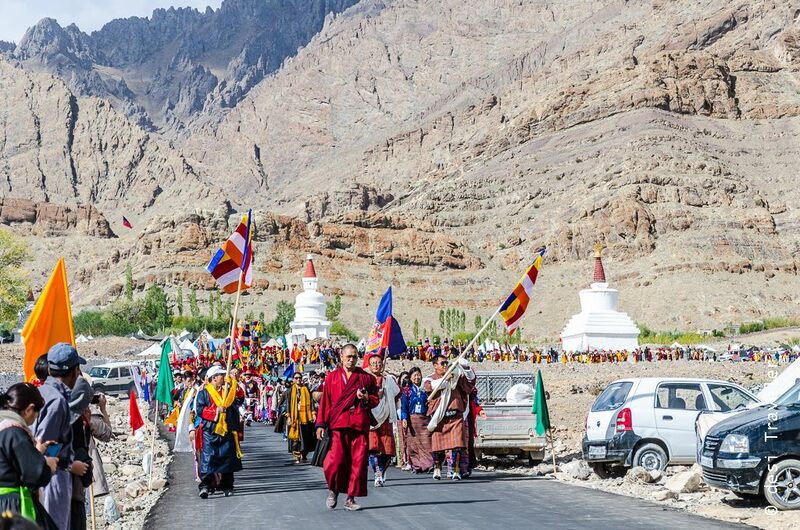 We have a lot to learn from the people of Ladakh as I mentioned in my earlier post about the Naropa Festival and organising a wonderful festival is only one of them. With this, I would like to close this post praying for peace and prosperity for all. You can also check this video clip that I clicked during the Naropa Festival and that has been created using the Flo App. Great pictures. 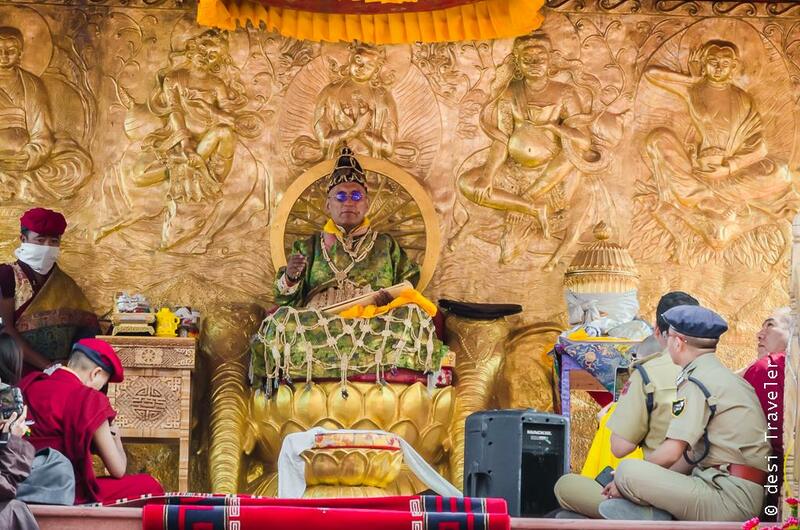 I can never forget the colourful and extarvagant Naropa festival anytime soon. Gorgeous photos Prasad! They capture the essence of the festival perfectly. 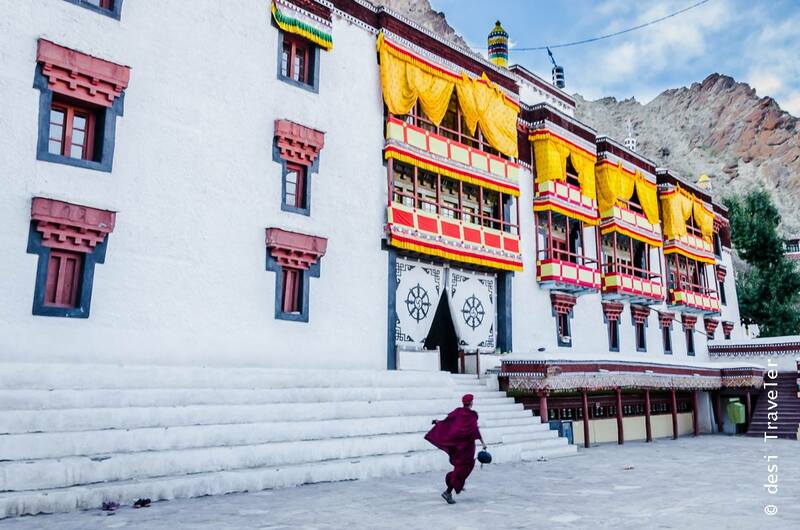 Love the one of the prayer wheel and of the nuns walking down the road. The fact that the festival was so well organized is something to be very proud off. Thank you for sharing your experience. Thanks Chaitali.. indeed the Naropa Festival is something to be proud of for all Indians.. So Michelle Yeoh attended too! I have always liked your pictures but this one is extra beautiful! The beautiful pictures against the backdrop of the brilliant blue sky was a visual treat. I may never be lucky enough to visit the Naropa festival but thanks to your post, I will have no regrets. 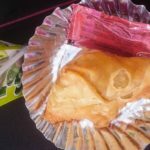 Thanks Purba…Hemis celebrates Hemis Festival every year around July you may want to check that . Pictures are so enchanting that it left a magical spell upon me. Excellent pics with nice info !